IBreakfast at hotel, enjoy Trivandrum city tour and later drive to Kovalam beach is known as the "Paradise of the South". Kovalam is just 16 kms away from Trivandrum, Kerala's capital city. Kovalam is an evergreen and pleasant climatic beach resort.. With high rock promontory and a calm bay of blue waters, this beach paradise creates a unique aquarelle on moonlit nights. Kovalam was brought to the public eye by the Maharaja of Travancore. Over the past three decades, the place has been well developed, and now figures prominently on the world tourism map. The warm and clean atmosphere by the coconut trees and the white sandbed are perfect for relaxing holidays, as the seabreeze gently plays with the waves. Overnight at Hotel. After breakfast at hotel. Drive to Kanyakumari for excursion tour. It is 86km from Trivandram. The land of ‘Sangam’ (convergence) of the three oceans - Bay of Bengal, the Arabian Sea and the Indian Ocean, Kanyakumari, is the southernmost point of peninsular India and has been enticing tourists due to its geographical positioning. A picturesque sight of sunrise and sunset, long stretches of sand of many hues accentuate the city’s serene and astonishing natural environment. Kanyakumari is also a popular pilgrimage destination for Hindus. Enjoy sightseeing tour by visiting Kumariamman Temple, Vivekananda Rock, Gandhi Memorial, Guganathaswamy Temple, Udyagiri Fort, Nagaraja Temple, Padmanabha puram Palace. Overnight at Hotel. . Morning, after breakfast we will proceed towards Varkala - the most unspoilt beach resort of India. Varkala is the only place in southern Kerala where one can find cliffs adjacent to the Arabian sea. These tertiary sedimentary formation cliffs are a unique geological feature in the otherwise flat Kerala coast, and are known among geologists as Varkala Formation and a geological monument as declared by the Geological survey of India. There are numerous water spouts and spas on the sides of these cliffs. JanardhanaKrishna Temple entrance, Varkala A famous beach resort, Varkala is also famous for its 2,000 year old Janardanaswamy temple, which is an important Vaishnavaite shrine in India and is referred to as Dakshin Kashi (Benares of the south). The temple is located close to the Papanasam beach, which is considered to have holy waters which wash away sins, and is also an important Ayurveda treatment centre. You also have the option of trying some traditional body therapy here. Overnight at hotel. Today ride into Kumarakom - the backwater country - by speedboat or a luxury cruiser from Varkala and feel at peace in its small-town hush. Feel at home! Enjoy a boat ride into the countryside and your visit to the Bird Sanctuary. If you are adventurous, you can indulge in water sports such as Wind Sailing and Water Skiing. You can even take a canoe out into the quiet lakes. Stay overnight at the hotel. Getting to Periyar is as sublime as the destination itself. A scenic journey past mist- capped mountains, spice plantations and open grasslands lined with spectacular water falls and delightful trekking trails form the access to your hide way here. On arrival check into the hotel, refresh yourself and be relaxed. Stay overnight at the hotel. Today you might have an opportunity to meet a tiger as, you go to Periyar Tiger Reserve. Trekking with a local guide familiarizes you to the rare birds, trees and flowers that you come across here. You can even set upon a walk through the plantations filled with the heady fragrance of fresh spices. A boat safari on the Periyar Lake extends a lifetime's chance to spot exotic wildlife in its natural habitat - like the eccentric bathing habits of the wild elephants that come down to the lake. Stay overnight at the hotel. In the morning, head towards a place which is called " nature lover's paradise" Sprawling tea plantations, a picture book town. Winding lanes filled with the heady fragrance of fresh tea, all 1800m above the sea level. After arriving there, check into the hotel. Overnight to be spent at hotel. Munnar has the highest peak in South India - Anamudi - which towers over 2695m. An assortment of wild life such as the Nilgiri Tahr, Nilgiri Langur, Sambar, Gaur and the lion tailed Macaque are found in the rich tropical forests around. 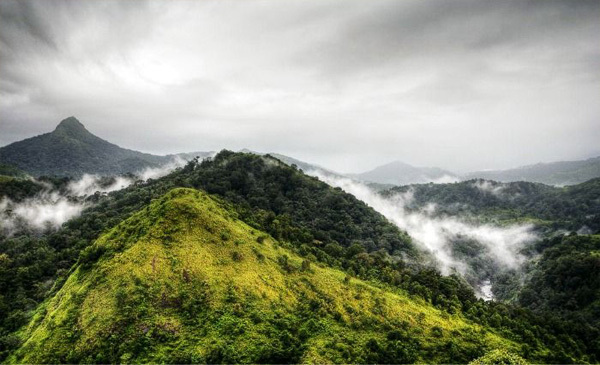 Devikulam - This serene hill township is a nature lover's retreat. Trout fishing on the Devikulam lake is a major attraction. Eravikulam National park - It is the best place to see Nilgiri tahr, the mountain goat of South India. Stay overnight at the hotel. Today morning drive to Cochin. On arrival in the "Queen Of The Arabian Sea" check into the hotel. Afternoon, free to relax. In the evening enjoy a Kathakali dance performance. Kathakali is renowned through out the world for its harmonious blending of poetry, music, costumes and gestures in a narration of stories from the Indian Epics. Stay overnight at the hotel. Morning city tour covering: Jewish Synagogue - Built in 1568 the oldest synagogue in the commonwealth stands, adorned by hundreds of exquisite hand - painted Chinese tiles in blue & white. St. Francis church Originally, built out of wood in 1503 and thus earning fame as the oldest European church in India. Vasco de gama was buried there. Dutch Palace - As you climb its stone steps, you enter a different world of Palanquins and heraldry, jewels and rich murals. Roam about in the cobbled streets, you will love it. Stay overnight at the hotel. Transfer to the airport to board the flight back home.